sorts of errands to run, so this post has to be short and sweet. OMG this outfit is too cute! i love your style! this is one of my favs! you look so sweet, i love the collar too much! Loved this photos and this outfit! You look so so sweet! That collar is amazing, and I love the flash of cobalt on those shoes. I actually just finish DIYing a sweater similar to that one, to be posted soon. Another adorable outfit! Gorgeous as ever, Bonnie! <3 I love the detailed collar, and your glasses are the prettiest shape! what a pretty collar! I love it teamed with a slouchy knit - inspiring! ideal accessories. bag and neck jewelry. Another cute outfit! I loooove the collar, so colorful and cute! 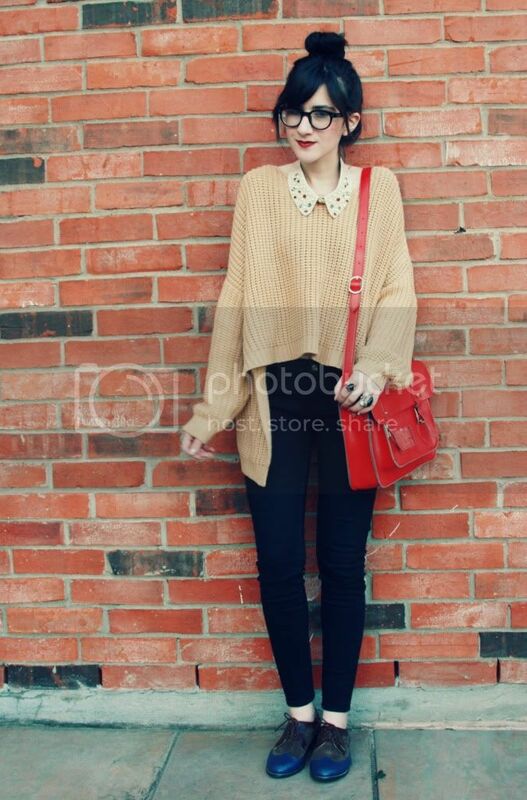 Loving the red bag with the beige sweater! love that little collar, it really makes the outfit. Cute collar and cute shoes! I adore your shoes, I want them so badly! Aw you look adorably cozy. I really really love your collar. so cute! i want a jumper just like that! what an absolutely beautiful outfit! oh wow! I love how the collar glams up your chunky sweater! Such a coincidence I posted about collars on the blog today! Enjoy the weekend! I love the collar, so pretty! i love that jumper and ur purse!! lovly! You look gorgeous! I love everything here <3 The satchel is sooo perfect! The collar matches the jumper perfectly! the collar is totally cute! omg! i love how you put everything together!! 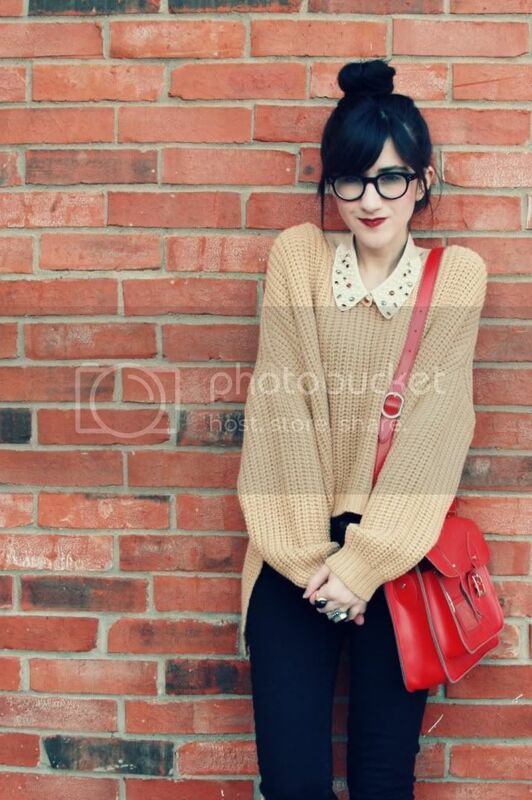 the oversized sweater, embellished collar, glasses, lip color, hair! What a cute collar necklace! It totally makes the outfit! Too cute! I'm loving this post! Especially those snazzy shoes! I love everything about that sweater! The back being longer and the huge sleeves are amazing. That`s a pretty collar.. I so love it! 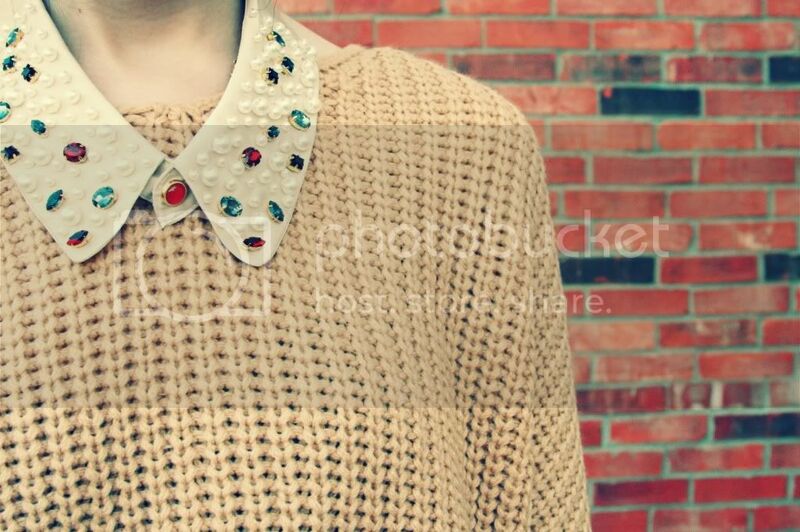 love your sweater with this collar! Such a great photo of you! I love the outfit and adore the collar! Love your outfit: cute collar, fantastic shoes and bag! Great outfit ! Love your collar !!! Amazing outfit! I love your collar! You look simply stunning! ♥ I love the colour, and how you combined so amazingly well! OMG I'm so in love with your collar! they're pretty :) you got perfect sweater too! I really love this look, the makeup, hair, and the collar. Beautiful. such a gorgeous outfit! i am absolutely loving this look. it's cozy, chic, and overall lovely! you are such a beautiful girl! i love your glasses and lipstick, too!! i am now following your blog! i love it. i must ask..what camera do you use, your photos are all so outstanding! i hope you can follow my blog, too! we are having a tory burch giveaway-i hope you can enter!! I really love the collar! Thank you :) I love your sweater! That hairstyle and those glasses are totally cute. 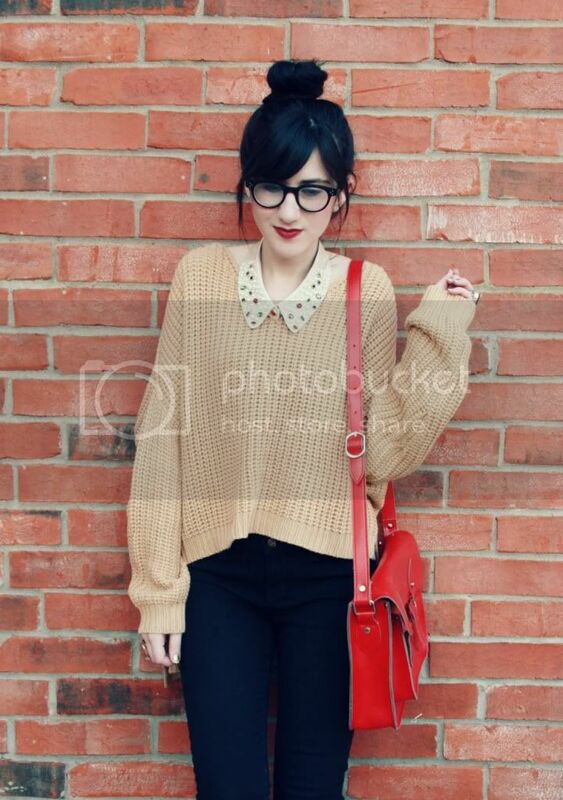 The detailing on the collar makes it edgy and I love that red satchel. Thanks for checking my blog. Just found a new DIY..
You look so adorable! Your beautiful pale skin is flawless. That collar is just perfect as well. What a pretty little collar, and I love all your rings! This sweater is awesome....and love that collar...so cute! Love this entire outfit. That collar is gorgeous! Wow This Winter Outfit is Simply Perfect! The Color Combination is Awesome! so cute! LOVE you in a top knot too! Fun!! You look so geeky cute here. That sweater has an interesting shape to it, I like. Wonderful look. Love that collar. Where is it from? Love that sweater, it looks super cozy! Oh my goodness! Could u get anymore cute!!! I adore your style! You're super cute and adorable!